About Piranha Hose Products, Inc.
Piranha® Hose Products, Inc. has been providing high pressure sewer hoses to industry since 1959. In 2005, Piranha became a Kuriyama Group Company. 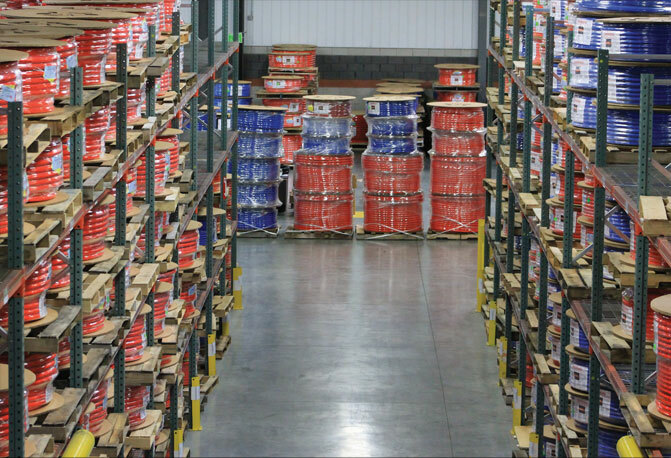 Centrally located in the heart of Northern Michigan, our modern production facility provides industry with quality made high pressure hose products that deliver reliable performance for the sewer cleaning, paint spraying and hydraulic hose markets. Specially engineered hose products are also available to meet the application needs of an ever changing marketplace. Please contact us for more information on your inquiries. Piranha has a worldwide distribution network in place to make sure that our customer's needs and expectations are met on a daily basis. In 1959, reinforced tubing was developed for high pressure applications. In 1961, the first patent for high pressure hose was granted. Polymer acquired Gay Hose in Niles, MI in 1965. This served as a coupling facility for hose assemblies. In 1969, Polymer was acquired by ACF (American Car Foundry). In 1970, the patent for a polyurethane cover was granted. In 1979, the patent for polyurethane used to cover nylon reinforced hose was granted. In 1983, the trade name “Piranha” was registered. In the late 1980’s the operation moved to Reading, PA. The assets of Polymer were purchased by DSM (Dutch State Mines) in 1989. Avon Rubber Products bought the polymer division from DSM and moved the operation to Cadillac, MI in 1998. In 2001, former employees of Avon Rubber Products bought what is now Piranha Hose Products. In 2003, Piranha Hose Products moved into their current Weigel Street location. In 2005, Kuriyama of America, Inc. purchased Piranha Hose Products.